The Merck Serono Biotech Center (MSBC) in Corsier-sur-Vevey, Switzerland, is the center of Biotech Manufacturing & Process Development of Merck Serono. It produces biopharmaceuticals, which are composed of large molecular structures such as proteins that are created from live cells using recombinant DNA technology. Operational since 1999, the MSBC is one of the largest and most technologically advanced biotech centers in the world, producing biotech products for clinical trials and commercial phases, and is also engaged in the development of high-performance processes. This site has particular expertise from small to large scale mammalian cell culture technologies, and uses many different technology platforms. The site currently produces the active ingredient for Merck Serono's multiple sclerosis treatment, Rebif® (interferon beta-1a) and for the targeted cancer therapy Erbitux® (cetuximab). An expansion project to increase capacity at the site was recently completed in order to allow for world-scale production of monoclonal antibodies as Erbitux® and other biopharmaceuticals. The new facility is comprised of an upstream plant (USP), a downstream plant (DSP), a utility area for supplying clean media as water, air and steam for the production and moreover an on-site waste water treatment plant. For this new large-scale biotech (LSB) production facility, Yokogawa Deutschland GmbH of Ratingen, Germany installed the CENTUM VP production control system, VP Batch package, Exaquantum/Batch plant information management system, and PRM plant resource management package along with more than 2,000 FOUNDATION™ fieldbus devices and nearly 6,500 PROFIBUS™ control valves. To assist in this undertaking, Yokogawa Deutschland enlisted the support of its Swiss branch office (established in 1999) and also entered into strategic partnerships with local engineering and service partners. Merck Serono later concluded a lifecycle maintenance agreement with this Swiss office. 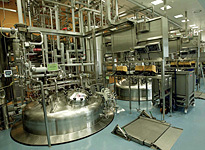 Merck Serono's target was to have an "integrated e-plant from vial to bulk," necessitating the complete computerization of processes from ERP to automation system. Many different kinds of software packages are used in this highly advanced pharmaceutical facility, and various systems like PLCs with PROFIBUS interfaces are integrated with CENTUM VP, the plant's core automation system. Recipes with numerous parameters are all managed using the VP Batch package, and clean in process sequences are configured in the system by means of the sequential function chart (SFC) function. Many different graphic displays allow operators to identify at a glance the current status of a particular phase of a batch process. Operators are thus able to see clearly, know in advance, and act with agility at any time and place in this facility. Production data from every batch operation is collected by Exaquantum/Batch for the generation of automation batch reports required under 21 CFR Part 11 of the US Code of Federal Regulations. This allows operators to see clearly the result of each batch activity. This package exchanges important data with the manufacturing execution system (MES) relating to material management, dispensing, cell cultures, purification, and total quality management. 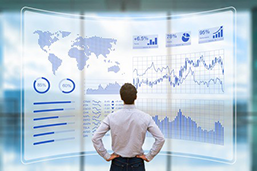 The data is also used to analyze the quality of the products and to check the efficiency of every operation, which is essential for the achievement of operational excellence. The visualization of all production data also allows improvements in the usage of water, electricity, and other resources. Automation system vendors that supply products and/or engineering services to pharmaceutical companies that follow good manufacturing process (GMP) procedures are required to support computerized systems validation (CSV). Toward this end, Merck Serono audited Yokogawa Deutschland to assess its GMP compliance. 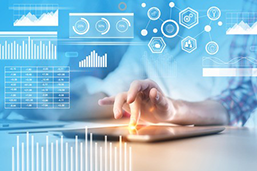 Yokogawa Deutschland has implemented quality and training system that complied with revision 5 of the good automated manufacturing practice (GAMP5) procedures audited. Merck Serono audited the quality system and indicated complete satisfaction with the results that were achieved. The ongoing maintenance of the thousands of FOUNDATION fieldbus devices and PROFIBUS control valves installed at this complex LSB production facility is key to ensuring accurate measurement and control. Yokogawa's PRM package was utilized at the plant start-up stage to check loops, parameters, and the different types of control valves (each with different characteristics), and to diagnose devices. This allows for a proactive maintenance approach and the scheduling of field device checks. Also, as all device data can be monitored online using PRM, the plant can be operated with a smaller field workforce. Dr. Andé Overmeyer, Project Director Merck Serono, said, "Our plant employs very complicated batch process and flexible production is required at all times. This LSB project was a world-scale and world-class project, and we needed world-class suppliers. Many packages are used and many different systems are located all over the Vevey plant. So we are always looking for ways to automate processes as much as possible. 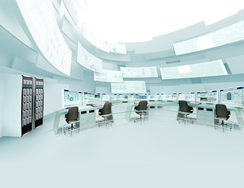 The core process control system is Yokogawa's CENTUM VP, and all systems are required to integrate with it. This system is connected to the MES to send and receive data essential for material management, dispensing, cell cultures, purification, and quality management. We are very happy with CENTUM VP because of its high reliability and good support from Yokogawa. Yokogawa is one of our best partners for process automation and software engineering." Mr. Nicolas Martin Clement, ePlant Manager Merck Serono, went on to say, "Our target for the Vevey facility is for it to be an 'integrated e-plant from vial to bulk.' We continue to strive to automate plant operations and make this a highly efficient operation that has less of an impact on the environment. In this 'integrated e-plant,' engineers and operators have ready access at any location to information on what is going on with the plant processes and can thus make quick and timely decisions." Exaquantum/Batch is an intelligent ISA-88 Batch Information System. It provides verified analysis and reporting facilities that collect, store and display current and historical data from batch production, equipment and recipe viewpoints.